Lincoln Nebraska is affectionately called the Star City... Why, you ask? Well, it should be obvious since it's the state capital. May 13, 2009 - Update from the Nebraska Game and Parks Commission that one of the eggs has hatched!! The latest cyber stars to hail from the Star City live high atop our beautiful state capital building. 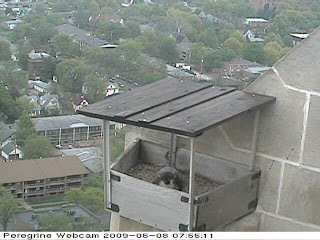 The nesting pair of Peregrine Falcons will soon be welcoming tiny bundles of fluff into the open air. On a related Nebraska Game and Parks Commission note, May 16 is free fishing and free park entry day in Nebraska. You can fish on any public body of water and enter any state park for free on that day! What are you waiting for? Make your plans now. Thanks for stopping by. The coffee is always on. Be sure to send me an alert if you see the chicks hatching before I do!